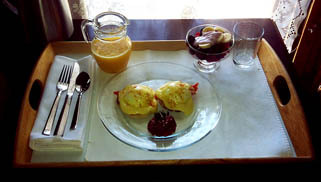 Bradford Place Inn: Breakfast Menu offers many delights for your enjoyment. 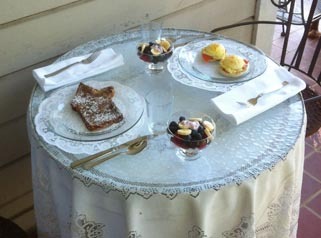 Enjoy your breakfast in our dining room at a table for two or socialize with other guests at the main table. Relax a little longer in the morning with our convenient room service. 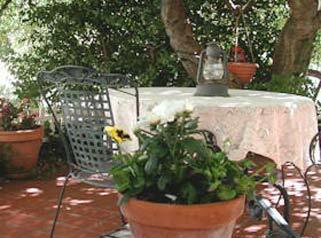 When the weather cooperates, we will be happy to serve you on the veranda. 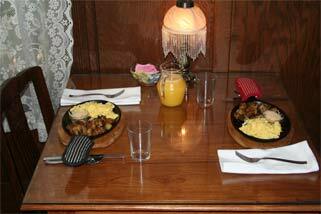 Yosemite Suite and Prospector Room guests may have breakfast served on their private patios. or any special dietary considerations (such as vegan, lactose-free, etc.). Fruit Cup Fresh berries and bananas, served with a light dollop of yogurt in season. During the winter months when the berries are not available, a baked fruit dish is served. perfectly poached eggs, topped with homemade warm Hollandaise Sauce. We have modified this recipe with a heart healthy approach. Upon request, the eggs may be replaced with egg whites or may be removed. Scrambled Eggs, Bacon and Sautéed Potatoes (True Hash Browns). Served in your own cast iron skillet!